Jack Morris, the founder, CEO and president of Piscataway-based Edgewood Properties, on Wednesday sent a letter to all of the renters of his multifamily properties, saying the company will defer any rent payments for anyone who is a federal employee impacted by the shutdown of the federal government. 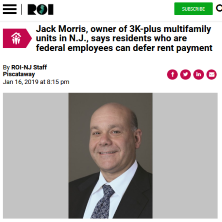 Morris, one of the co-owners of the Hard Rock Hotel & Casino Atlantic City, has more than 3,000 renters in his portfolio of properties, nearly all of which are located in New Jersey. Morris, who quietly is involved in a lot of charities — including many that involve veterans, is hoping other property owners will follow his lead.